The plein air tendencies evident in Greek painting in the late 19th century continued into the 20th. Odysseas Fokas, an artist who worked during that period, was regarded by his contemporaries as the leading Greek landscapist; he introduced new approaches to plein air painting. Other artists, who did not wish to clash with tradition, continued to produce descriptive views of the Greek landscape, island views, evocations of mainland or maritime areas, capturing the diversity of the Greek countryside. Influences and echoes of Impressionism and the movements that it engendered, however, are not totally absent from their works. Influenced by Post-Impressionistic modes, Epaminondas Thomopoulos’ output falls within that current. 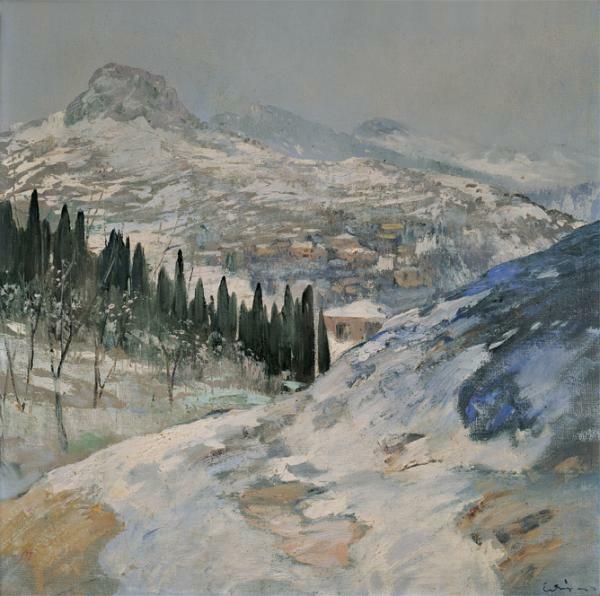 In his impressive landscape view of Mount Helmos, he emphasised the picturesque rendering of the mountainous landscape, using light colours and syncopated brushwork. Landscapes by Konstantinos Romanidis and Georgios Kosmadopoulos betray the influence of Impressionism, whereas the view of Cephalonia and the Argostoli Gulf by Vassileios Ithakissios is firmly arranged in colour bands defined by horizontal and vertical axes. The unique geophysical formation, as well as the architecture of Santorini, inspired Dimitris Gioldassis and Nikolaos Heimonas in the 1920s. 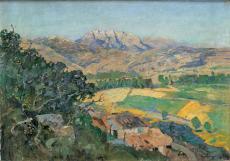 Stelios Miliadis, who studied in Munich and Paris, and Andreas Georgiadis of Crete, who long taught as professor at the Athens School of Fine Arts, opted to produce views from life in the countryside. 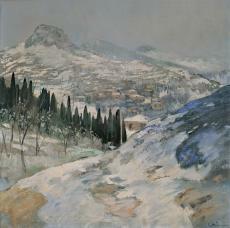 He studied at the Fine Arts Academy of Naples (1896-1899) and went on to study in Rome and Venice (1899-1903). A professor at the AthensSchool of Fine Arts (1915-1948), he also became its director from 1945. He received the Greek Award for Excellence in the Fine Arts (1927) andbecame a member (1930) and president (1961) of the Academy of Athens. He received the Commander of the Order of the Italian Crownand the Commander of the Order of Merit of the Italian Republic. He participated in the Paris Exposition Universelle (1900, honourablemention) and the Venice Biennale (1934, 1936). His most characteristic works – mainly landscapes and farming scenes – reflect the Impressionist and Post-Impressionist tendencies thatsurvived in 20th-century Greek painting.